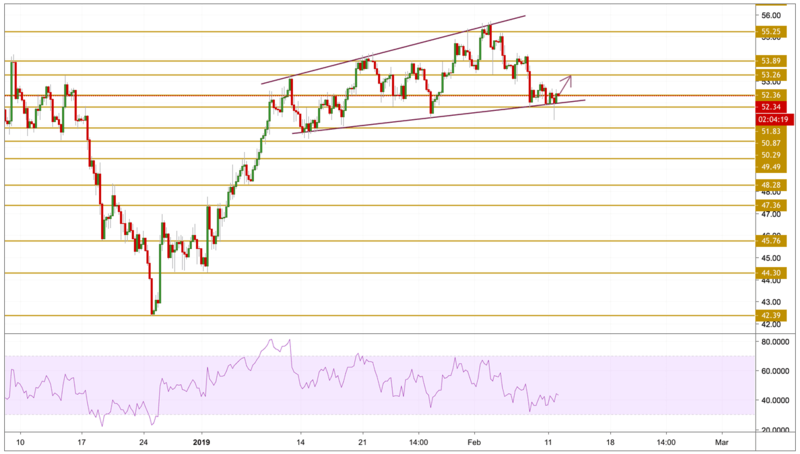 Doubts over US-China trade-deal continued flashing worries over future energy demand as prices retreated towards the $51 level before finding support. Adding to the WTI weakness, the strength of the US Dollar and the on-going supply cuts measures taken by the OPEC+ alliance, in addition to US sanctions on Iran and Venezuela failing to keep investors interested. The greenback managed to register a noticeable rise on Monday amid weaker GDP data from the UK and speculations of weaker global growth. The downside remains capped by the effect of the sanctions and further production cuts. Crude oil prices found support at the $51 zone after breaking below the $52.36 level. The price is still holding above the lower band, hovering just below the $52.36 resistance level. The black gold is steadily gaining momentum as we can see on the RSI's chart. The next level we will be watching is the $53.26 resistance level.